Start with a standard 55-gallon steel barrel (you supply). Cut a door opening and smoke outlet. Bolt on the cast iron pipe connection, doorframe and legs. Barrel must be clean and empty of chemical contaminants and have permanently attached, non-removable, ends. 55-gallon barrel creates giant 7 cu ft firebox. Single barrel kit includes pipe connection, doorframe and legs. Double barrel conversion kit (sold separately)includes cast iron stand and pipe fittings. Heat output jumps by 20% if you add a second barrel (smoke chamber) on top. Note: This stove is NOT UL Listed. Barrel Stove worked on our Homestead in Alaska for 5 years. These stoves are excellent low cost heating devices. My Dad and I cut the holes out with a coal chisel and hammer to make ours in 1959. Barrel stoves work great. They must be on a fireproof hearth. Leave the ashes in the stove- this insulates the floor by keeping the heat from going down ward. Rake hot coals forward, add more wood and it burns front to back. Get the air tight model. We hope Lehmans will re introduce the famous Sotz barrel stoves that were made in Ohio. I still have one 40 years old. 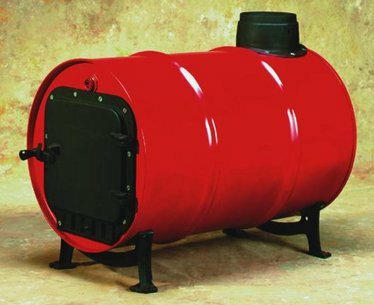 Barrel stoves like this work just fine in an outdoor shed or barn with a dirt floor, with nothing flammable underneath or around them, with plenty of space between the walls and the ceiling of a building. These stoves can get rippingly hot, and without adequate heat protection underneath and all around such a stove these stoves could easily light a house on fire. Picture a floor catching on fire, for instance. Yeah, these kinds of stoves can do just that. These stoves ARE NOT for amateur wood burners. Yes, be careful, be very, very careful! Oh yes, this stove can burn wood and can throw a lot of heat, inexpensively. But its cylindrical burning barrel can also throw excessive heat downwards onto a potentially flammable floor surrounding the stove. And that calls for equally excessive foremindedness and preparation. As much as I love Lehman's Hardware, in this instance I am writing to help you keep out of potentially serious, potentially dangerous trouble. These stoves have been around for many years , cheap, inexpensive, affordable, but then there is the reality of what they can actually do. And so, PROVIDED that you have the necessary floor, wall and ceiling heat protection as necessary then fine, go for it. But keep in mind that stoves such as this can also otherwise throw a rippingly powerful amount of heat, potentially dangerously hot. And so, please be careful! This stove is great for the workshop, Puts out a lot of heat for the cold days of winter.